"Our Message" Inspirational Christian based Hard Cover, 60 page Coffee Table book has arrived! “Our Message” Inspirational Christian based Hard Cover, 60 page Coffee Table book has arrived! (www.ourmessage.com.au) has been written to challenge non-christians about Christianity and to give an understanding of the Christian Faith. Eleven christians, myself included, have shared our Love for God. This book started out as what I thought would be simply a book of cards with christians sharing their testimony, however it became much more than that. You see, God also used this time of book preparation to challenge me also. As I worked more and more on the book it became evident that God expected much more detail than what I had planned in the book. Our Message contains ten christian testimonials, one christian poem, twelve biblical excerpts, twelve tear-out postcards, ten envelopes and one bookmark, all for the recommended retail price of AU$24.90 plus postage if you purchase on-line. Of course all of this wouldn’t have been possible if it wasn’t for the love, patience and understanding of my lovely wife, Judy. 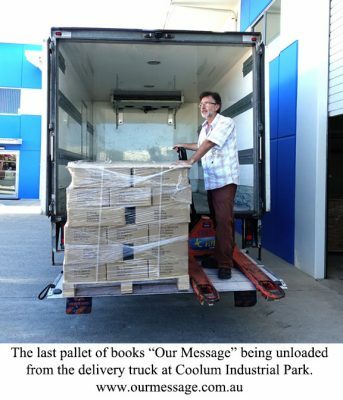 Unloading the shipment of books, Our Message, into the Coolum warehouse. 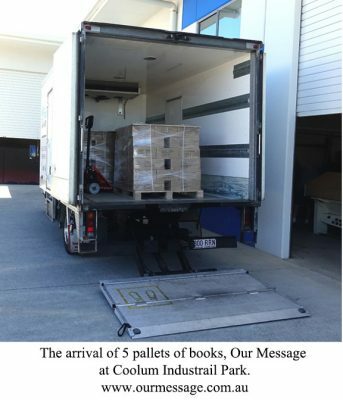 Unloading the shipment of books, Our Message, at Coolum. 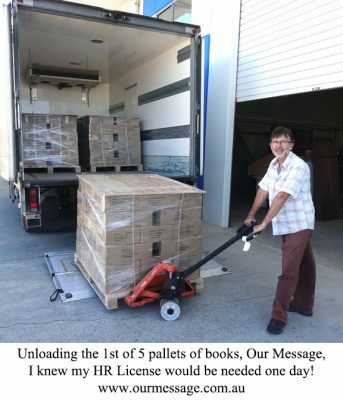 Unloading the shipment of books, Our Messagee.